The M 222 is a modular head amplifier with a tube circuit, designed for use with the 20 small-diaphragm capsules in the Schoeps Colette series. It is named for Schoeps’ vintage M 221 B tube microphone, but updates the original design to incorporate modern components and a transformerless output circuit. The M 222, like its namesake, originally used a selected Telefunken AC701k subminiature triode. Since 2006, new M 222 microphones have used a different tube that has not yet been identified. From the very beginning the M222 was designed for the use with different types of tubes. The early models had the AC701 until this valve was sold out worldwide. Which tube model is used for a special M222 depends on its serial number, its date of manufacture and its date of delivery. So we cannot tell this in common. But all tubes are original German AEG Telefunken valves NOS (new from old stock), triodes in very most cases but also pentodes are possible. The NT 222 AC offers a P48 mode for use with phantom-powered microphones. It has a -10dB pad and a 5-way “Harmonics” switch to alter the bias point (“Q-point”) of the tube, affecting the degree to which tube coloration is present in the output signal. The DC model changes the Harmonics switch to a single step, but offers a 5-way gain position: -10dB (“Tube direct”), 0dB, 10dB, 20dB, 30dB. Both power supplies provide a high-pass filter (-6dB/octave @ 150Hz). 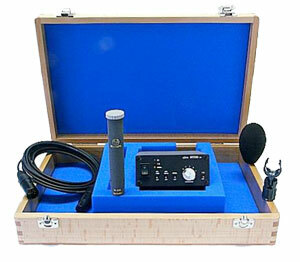 The M 222 ships with either power supply, a mic clip (p/n SG 20), and a foam windscreen (p/n B 5) in a padded wooden case. The head amplifier and both power supplies are manufactured exclusively for Schoeps by Elvo Mikrofonbau. The mic was released in 1996.